Like every morning, today too, leaving home early I met Nunziatina, the porter, which greeted me and held me with her usual chat about how cold the last few days have been. “How cold it is today Mr. Enzo” – said Nunziatina – “these are really terrible days. Since it is cold, I cooked the polenta with sausages for my husband for dinner tonight”. After these few little talks, I said goodbye to Nunziatina and I went to the pizzeria. While I was stuck in a traffic jam, my porter’s words were swirling around in my head; I kept thinking that Nunziatina was absolutely right and that eating the cornmeal mush during these cold days was really perfect. In the popular imagination everyone thinks that the polenta is a Northern Italy traditional dish. Actually, it isn’t. It is surely a poor food typical of farmers’ eating, arrived in Italy only after the discovery of the Americas when the cornmeal started to be imported in Europe. Its use was recorded throughout the peninsula with different regional variations: it was mainly consumed with meat in the North while people liked to combine it with sauce in the South. And then there it is, the deep-fried polenta better known as scagliuozzi. In Napoli we are really good at cooking scagliuozzi, that is the polenta cut in thick pieces usually shaped like small triangles, or also trapezium, which are deep-fried and salted. Genuine street food example found in Puglia and Sicily too, but with different names that take a purely dialectal nature. In the book “Galleria di costumi napoletani” written by the Neapolitan poet, writer and translator Domenico Jaccarico in 1875, I read something about the city’s crafts and sellers. The street fryer was a relevant figure, present at every corner and which in his “tielle” (large cylindrical pans) fried the scagliuozzi and “robba ammiscata” (a variety of fried foods) using exclusively boiling lard. Don’t tell me you have never tried these delicious items. It is the classic “cuoppo” with zucchini flowers, fried eggplants, the scagliuozzi, deep-fried rice balls and pasta cresciuta (risen dough) to eat very hot in Naples narrow streets. Today it is called street food but scagliuozzo, or in wider terms “il cuoppo fritto” (a paper cone filled with fried foods) has always been part of our culinary tradition. 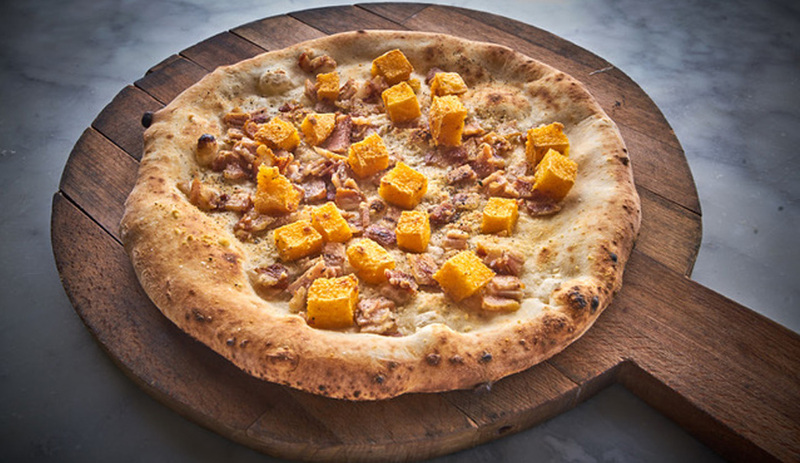 Hence the idea: a pizza with cicoli (pork scratchings) and scagliuozzi. I thought to use the cicoli, the pig belly which is boiled, compressed and then cut into cubes, the scagliuozzi, diced and fried. It all goes on the dough disc with a sprinkle of pecorino romano cheese and pepper. Out of the oven, this pizza is well balanced and absolutely tasty: it is the perfect pizza to keep us toasty. I should absolutely tell Nunziatina to let her taste it. Tomorrow, though. Now it’s late, I meet her only in the early morning at my doorstep.